Original Enterprise Model Turns 49! 49 years ago today, on December 29th, 1964, the original filming model of the U.S.S. Enterprise was delivered to the Howard Anderson Company. There, it would be used as the centerpiece for optical effects scenes to be included in the pilot episode of what was hoped to be a new television series, Star Trek. Model maker Richard C. Datin, Jr. oversaw the efforts of model makers Mel Keys, Vernon Sion, and Volmer Jensen in constructing the 11-foot model from a 1-foot prototype Datin himself built. The prototype and the larger model were based on the design created by legendary Star Trek production artist Walter M. “Matt” Jefferies. Datin would later modify the model prior to its use during the filming of the original series’ first pilot, “The Cage", alter it again for the second pilot, “Where No Man Has Gone Before,” and then again once the show sold to NBC and filming began on the series’ first season. The model was donated to the Smithsonian’s National Air and Space Museum in 1974. Originally, it hung in one of the first-level galleries, where it remained until the mid-late 1980s. 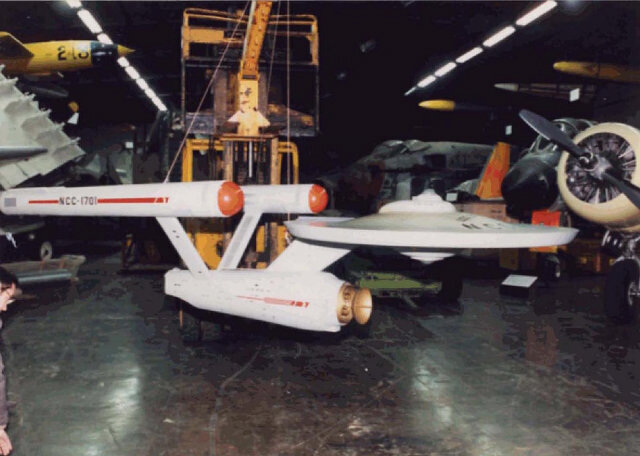 The Starship Enterprise during its third Smithsonian restoration, December, 1991. 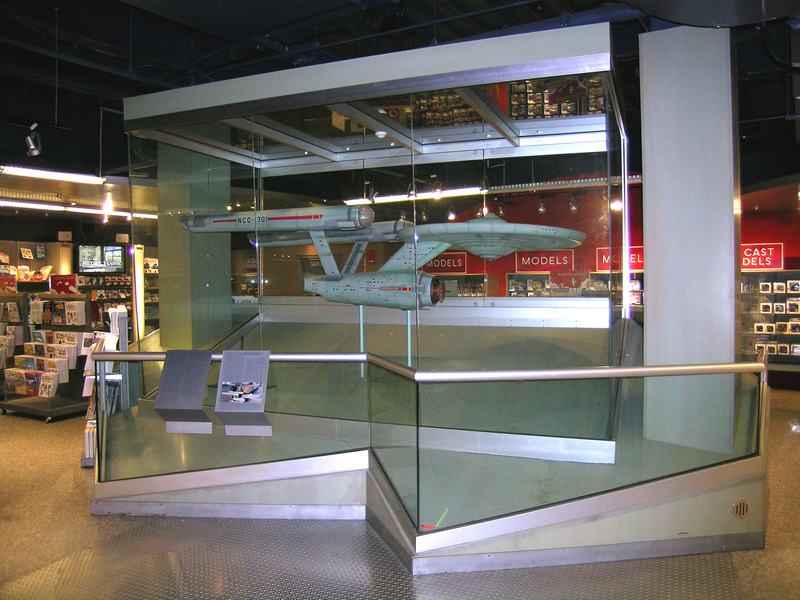 After the restoration, the Enterprise was displayed as part of a Star Trek exhibit in the mid 1990's. It is currently on display in the lower level of the museum’s main gift store. The museum also maintains a blog, with two articles detailing the museum’s restoration of the model. They are both short and worth a read. The also Smithsonian maintains an information page about the model’s history. Much thanks to Dayton Ward, writer of Star Trek: That Which Divides and Star Trek: From History’s Shadow for posting this information on his blog. Please check out his books, which are throw backs to the Star Trek novels of the 80's/early 90's. 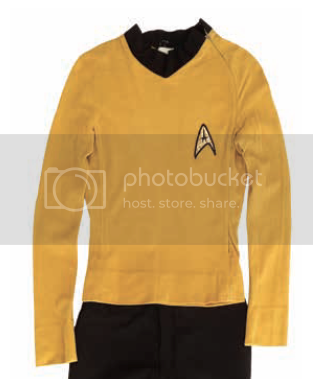 Let me start out by saying that I believe the Scotty and Sulu Tunics at tomorrow's Profiles auction are what is claimed. There is a good deal of circumstantial evidence, even though there is no screen matching. This is not absolute proof (which is what screen matching is), but the Burden of Proof has been met. But because one blogger has taken to shouting out his doubts, some people are asking me what I think. So here it is, all laid out. I am not an expert on TOS costumes. In fact I never hold myself out as an expert on Star Trek. I write a lot about it. I have handled a ton of the stuff. But that doesn't make me an expert. But I know who all the experts are, and when people come to me, I go to those experts. Here are the TOS Costume experts I know of. 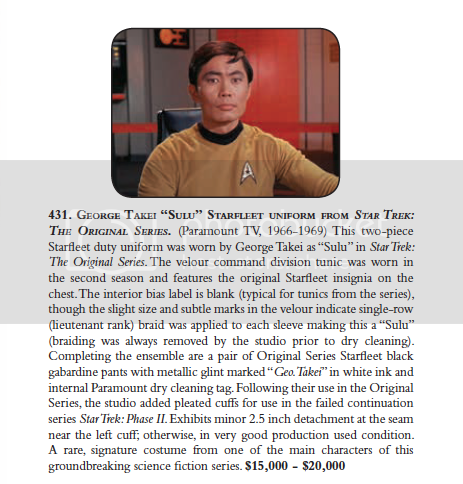 There are collectors such as Owen Riley who is very well educated on the subject, and of course Greg Jein has the biggest collection of TOS costumes, but frankly he doesn't hold himself out as an expert and doesn't authenticate anything. Now, of those experts listed above. Both Rob Klein and Gerald Gurian think the Sulu and Scotty are what Profiles claims. In fact, Rob has inside knowledge that Profiles has relied on to authenticate the costumes. Profiles has sold literally dozens of these costumes and they believe they are the costumes of those characters. And I inspected the costumes and went over them with Brian Chanes and they have all the markings that Profiles claims they do. And after talking with Rob, Gerald and Brian, I believe these costumes are what they claim. I also talked witH james Cawley, who said that the size ofthe Sulu was definitive as Takei was tiny, a 34-36. Now, it is circumstantial evidence for sure. There is sadly no screen match. And I have told Brian that in the future he should give me and the team a chance to screen match them for him. But circumstantial evidence is enough to get a murder conviction, so it is certainly enough here. Assuming you meet the burden of proof. SULU BRAID - The Sulu has the correct Lieutenant stripe braid marks left in it. This doesn't mean that it is Sulu's of course. SULU PANTS - The Sulu Tunic came on the same hanger as the Sulu pants out of the studio. Something you would know if you knew to talk to the guys who found these tunics at the studio. And as anyone who bid in the It's A Wrap auctions knows, character items were always kept together. SIZE - The Sulu tunic is TINY. George was a 34-36 and this tunic matches. This is definitive according to Cawley. And I concur with the logic. SCOTTY BRAID - The Scotty tunic has Lt. Commanders braid marks which makes it certainly Scotty's. I am only aware of one other instance where someone wore a red tunic with this braid, and that was most logically an actor using Scotty's tunic. The production was cheap and didn't use braid it didn't have to and reused costumes constantly. SIZE - The Scotty tunic matches the size for Scotty. This is not proof, but simply helps add to the circumstantial case. 2) Attacked the TOS Phaser earlier this year depite a 100% screen match. 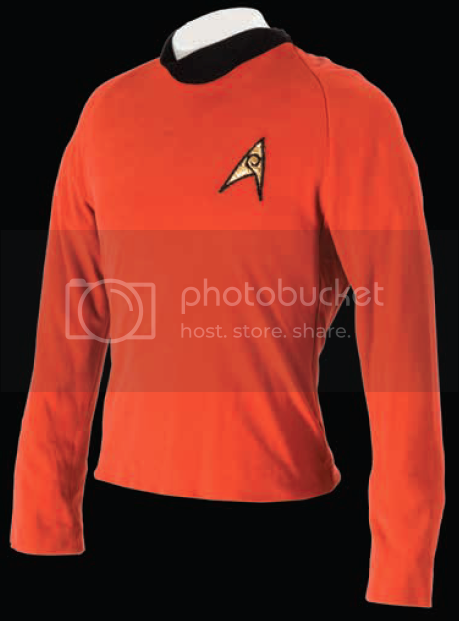 Both the George Takei and James Doohan costumes were part of a long-term collection from an individual who had top access to obtain the best of the best. As you know from books like Bob Justman and Herb Solow's book, Inside Star Trek, the show was a low-budget series and Desilu was notorious for being cheap. The production did not create numerous back up costumes, nor were stuntman tunics made. If a stunt was required, they would use the actor's tunic for the stunt and then return it to the wardrobe rack. If the crew visited a space station, they did not make 20 new tunics for the background. Unless a tunic was completely destroyed, the production used every shirt they had available to get the sequences shot. Once a tunic received too much wear after repeated cleanings, the production would relegate old hero wardrobe to background crew members. We have handled many Original Series tunics in the past exhibiting studio repair to small tears indicating their desire to keep them in service as long as possible. Needless to say, today's production practices towards wardrobe are completely different. The great majority of season one and season two tunics did not have the actor or characters labeled. A testament to this was the Spock tunic we sold in December, 2012 that was won by the consignor in a 1968 "Star Trek Design a Costume Contest". This tunic, complete with original braiding and insignia, came with a signed letter from Leonard Nimoy and a signed letter by costumer Bill Theiss, both referring to the recipient winning his "Spock tunic". This Spock tunic has no interior label, yet remains the best documented Star Trek tunic in existence. 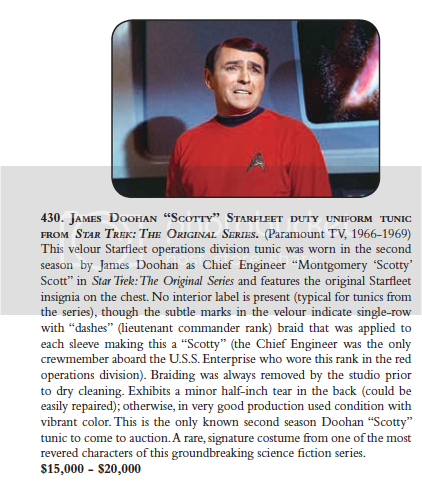 As stated in the catalog descriptions, both the Doohan and Takei tunics exhibit markings of the braiding indicative of their respective ranks. This, in conjunction with the general build of the actor, is the method of identifying the officer's tunics (unless you are lucky enough to screen match a signature marking on a particular garment). Wishing you a wonderful weekend and holiday season. Now certainly, Profiles didn't have to explain themselves to someone who didn't even bother to do any research, but they did. And there rationale is solid. I have been very critical of Profiles in the past. And still there are items that they have been fooled on. So I always do my own work. But on these two, I feel very certain that they are what is claimed. I have talked to the experts, and they feel the tunics are what Profiles claims they are. There is no 100% certainty. The Burden of Proof has been met, but without a proper screen match, you can't be absolutely sure. So the question is are you, the bidder, OK with the level of confidence the experts have. If you are, go for it! If not, let someone else win it.